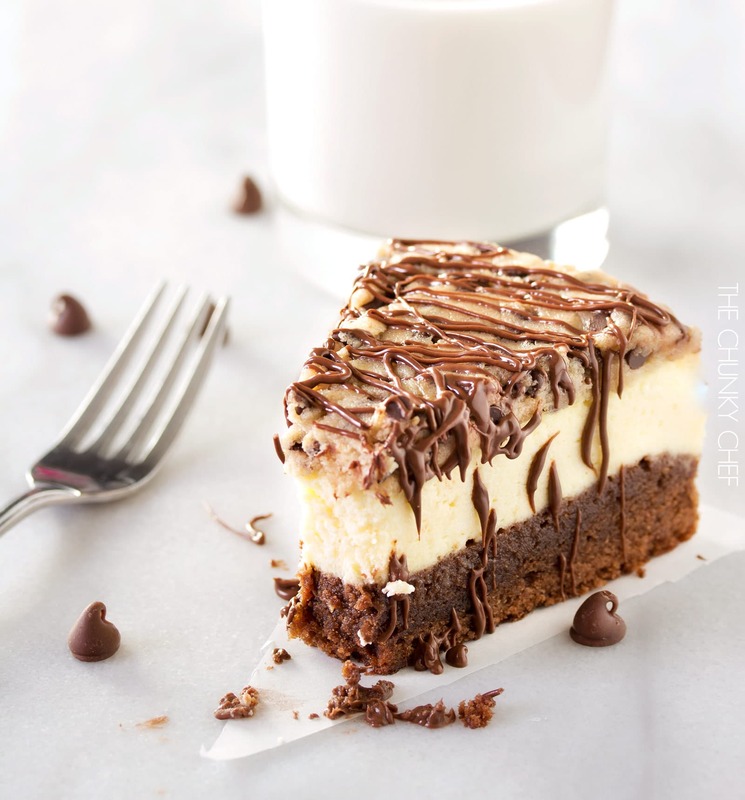 This impressive, yet super easy, brownie bottom cookie dough cheesecake looks as fancy as any dessert you’ve had from a restaurant! 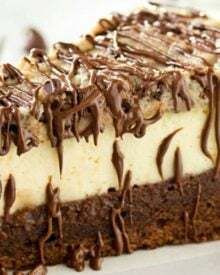 A fudgy bottom layer of brownie is topped with rich and silken cheesecake, then a layer of egg-less edible cookie dough is spread on the top and drizzled with melted chocolate. This is the ULTIMATE cheesecake for the ULTIMATE dessert lover! 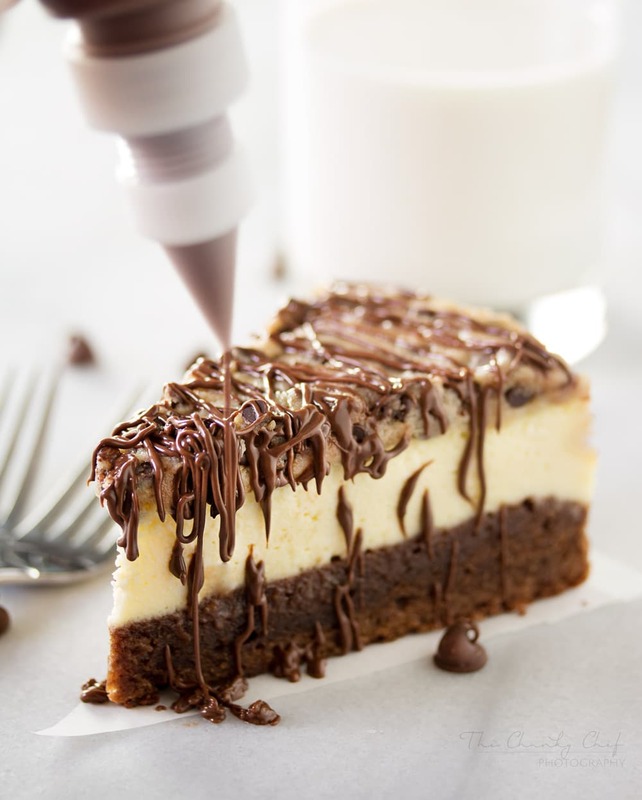 Brownie bottom cookie dough cheesecake deliciousness! Remember a few weeks back when I shared these Vanilla Chai Cheesecake Bars and let you in on a little secret of mine? About how I had a fear of baking a full on cheesecake…. well, I challenged myself and did it! Well, not fully I guess, since this isn’t a classic cheesecake… but I think it’s even better. 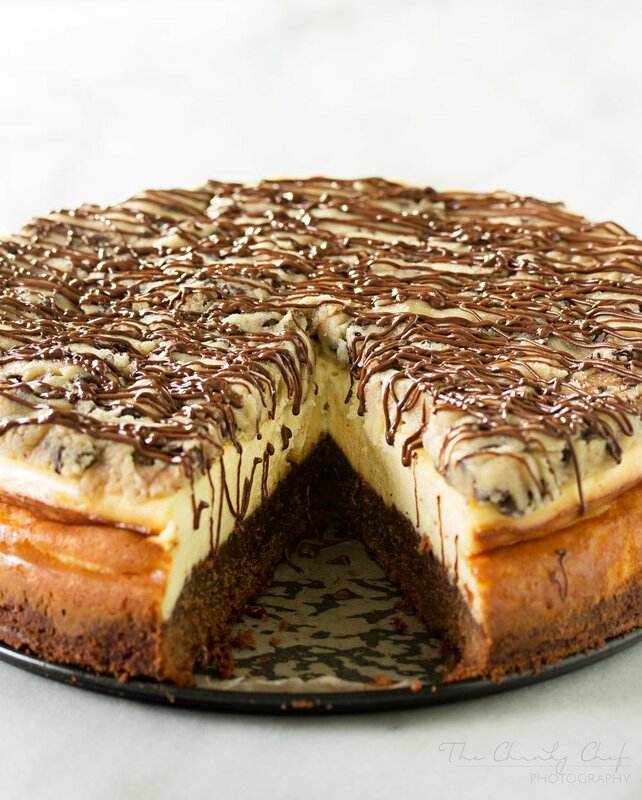 I made this brownie bottom cookie dough cheesecake for my husband’s birthday and let’s just say between us and the kids, we were fighting over who got the last piece! This dessert may look fancy and complicated because of all the layers, but really it’s super easy. The cookie dough layer on top is completely egg-less, so no salmonella worries here! Honestly, I think it tastes JUST like regular cookie dough, so it makes a great treat to whip up and eat by the spoonful as well. Stay tuned for another recipe using the egg-less cookie dough! I hope you make this cheesecake and enjoy every single bite of it… I know we sure did! 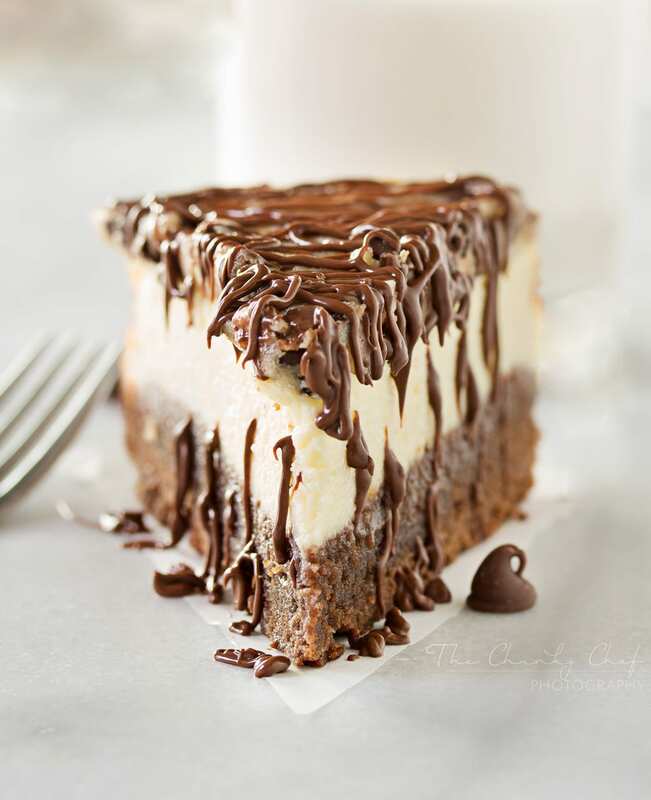 This impressive, yet super easy, brownie bottom cookie dough cheesecake looks as fancy as any dessert you've had from a restaurant! Preheat oven to 350 degrees F. Line bottom of a 9" springform pan with parchment paper and spray paper and sides of pan with cooking spray (I use a baking spray, but you could use regular spray and lightly dust with flour instead). In a small saucepan, melt butter and chocolate until smooth, over low heat, stirring often. To a mixing bowl, add in melted chocolate mixture, milk and eggs, whisking quickly so the residual heat doesn't cook the eggs. Using a stand mixer (or hand mixer), beat all cheesecake ingredients together until mixture is smooth. Take care not to mix too quickly, or air bubbles will form. Pour cheesecake batter over brownie layer in pan. Use an offset spatula to gently spread cookie dough over the top of the cooled cheesecake. This is done most easily when the spring has been undone and the cheesecake is free from the sides of the pan. If you can't spread the cookie dough, gently press pieces together to "spackle" the cookie dough onto the cheesecake. Microwave milk chocolate chips and vegetable oil in 30 second bursts (stirring each time), until nearly melted. Stir to melt remaining lumps. 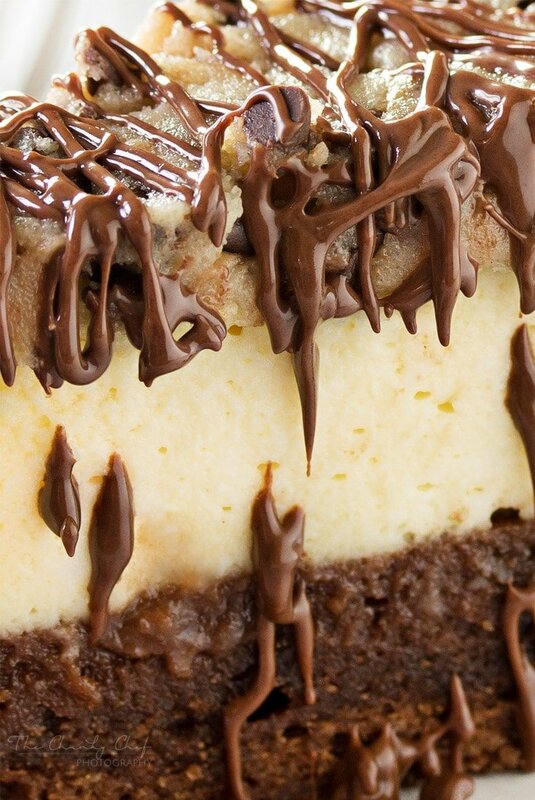 Drizzle melted chocolate over the top of the cheesecake. To slice, use a long, thin knife. Dip knife blade into very hot water, shake off excess and slice carefully. Between each slice, use a paper towel to wipe off cake crumbs and reside, then dip knife into the hot water again before slicing. Hey, so there’s no water bath needed for this recipe? I would just copy the ingredients into an online recipe converter. The majority of my audience is from the United States, and unfortunately, we don’t use the metric system here. Hello! Currently baking this right now! After the cheesecake cooks and I set it aside for an hour can I add the cookie dough layer or do I have to set it aside for the 4 hours, then add the cookie dough layer? Thanks can’t wait to try it! Hi Priscilla 🙂 It really needs that 4 hours (or more) of chill time to get to the classic cheesecake consistency. You set it aside for the hour to cool down to room temperature so you can safely chill it. Why does it have chocolate chips and vegetable oil then the title brownie batter? Wow!!! This cheesecake is absolutely amazing! I cheated on the brownie layer and used a boxed triple chocolate brownie mix and slightly under-cooked. Then, I followed this recipe exactly. I was nervous about the cookie dough layer being too gritty from all the sugar, so i let the evaporated milk “sit” on the butter and sugar after it was mixed for a couple minutes. It was not gritty at all. I made this cheesecake for a friend’s surprise birthday party and everyone raved about it. Some people told me it was the best cheesecake they had ever had! One thing I added was that i pressed the remaining mini chocolate chips from the bag around the sides of the cheesecake. The melted dark chocolate on the top just adds that “professional” appearance. 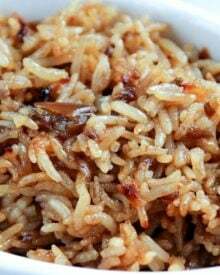 Thank you, Amanda, for this recipe! I will be making this again and again! Can you substitute a brownie mix? In the first step of making the brownies I melted the chocolate and butter until smooth then added the sugar and it’s pretty gritty and chunky. Is that how it’s supposed to be??? What size would this make in a square or rectangle? I don’t really know, as I only tested and wrote the recipe for a round springform pan. I had my boyfriend’s cousin & his wife over for dinner the other day and made this. I like to be extra and go all out, even if it’s just for 2 people. This was amazing. The only thing I did differently was bake the brownie for like 3-4 mins less than the time called before, because like many others, I was worried it’d be overbaked. It turned out perfect. My only complaint is with the cookie dough. It was delicious, but felt like I was eating sugar just because the sugar didn’t dissolve, so I felt the grittiness (although when everything was assembled it wasn’t that noticable). So I’m not sure if that was due to my mixing? Also, the cookie didn’t glue to the cheesecake. So when putting the fork in it to bite, the cookie dough topping would rise and fall off. But nonetheless, this was amazing and will definitely make again! I am baking this right now for my husbands birthday tomorrow! I am wanting it to be a surprise so I’m going to put it in our outside fridge. Will it stay good overnight in the fridge? And should I let it sit at room temp before serving? Thank you! Quick question.. Do you leave the cheesecake in the baking pan until ready to slice then? Hi Sandy 🙂 I usually do, so it’s easy to transfer from the refrigerator to serving. I made this for my son’s birthday and everyone in the family loved it! I am so doing this again! I made this for my granddaughter’s 12th birthday (her request). She and everyone else loved it. I would prefer it without the cookie dough layer (although it is really yummy! ), but the cheesecake is fantastic! Not overly sweet, but creamy. I covered the top with modeling chocolate, sculpting some roses for the top so it would be more like a birthday cake this is a keeper recipe. thanks! Was just wondering, would it work the same using low fat or fat free cream cheese as well as fat free sour cream? Hi Cassie 🙂 Unfortunately, I don’t usually recommend baking (especially cheesecakes), with fat free ingredients, as they can alter the taste and texture of the baked good. Baking is a science, and when you take away the fat, it alters things quite a bit. I’ve never tried this recipe with reduced fat cream cheese (or sour cream), but it *might* work, I just can’t vouch for it. Hey What a delicious recipe. I`m planning to do this, but got a couple of questions. First, in grams how much chocolat do i need? In my country don`t sell the chocolate chips so I have to buy a chocolate tablet.. Same question about the butter stick. How much des that weight? Thanks!! Hi Monica 🙂 Each butter stick is 4 oz or 110g, and the 3/4 cup chocolate chips would equal approximately 130g. The 1 cup small chocolate chips for the cookie dough would be approximately 175g. Hope that helps, and I hope you love the cheesecake!! 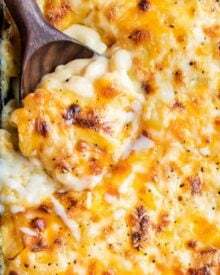 I plan on trying this recipe soon! Out of curiosity, what did you use when drizzling the chocolate on top? I saw there was a cool tool you seem to have in the picture but haven’t been able to find something like it. Hi Emily 🙂 I hope you love it! I used this squeeze bottle http://amzn.to/2gVFtuV , which is nice since you can use any icing tips you have (plus it comes with the plastic one shown). Just make sure there aren’t any lumps in the melted chocolate, or it’ll clog up (nothing a toothpick inserted into the tip can’t fix though). Just one question: your oven, do you use a conventional one or one with hot air circulation? Greetings all the way from Belgium! Hi Stefanie 🙂 My oven is a combination of traditional and convection. Hope you love the cheesecake! Awesome! I’ll let you know how it turned out :). Can’t wait to make it! Thanks! I’m so glad it turned out!! Hi! I’m new to the baking world and have never made a cheesecake before so I have a few questions. Would it be a bad call to take off the pan to put the cookie dough on and then put it back on? I’m also wanting to take this to the cottage, do you think it will withstand a 2h car ride? One more question, if I make it on Wednesday would it be alright to not eat it until Friday?? Made this yesterday and took it to work for a coworkers birthday, and oh my gosh, it was fantastic. All gone by the end of the day. It was very easy to make (no water bath!) and had a fantastic texture and taste! I will make this one again, for sure! Thanks for a great recipe! This recipe is amazing I can eat this cheesecake seven days a week 🙂 Thank you for sharing this amazing dessert with us. It looks really delicious just like I get on the diet. Made this recipe for a bridal shower and it was a hit! I didn’t have regular sweetened condensed milk , so used the dulche de leche sweetened condensed milk that I had in my cupboard, instead. I called it a caramel chocolate chip cookie dough. 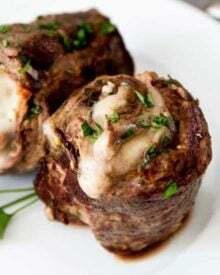 Will be making the recipe again this weekend for a BBQ and have already shared your website with anyone who wanted the recipe. Thanks for a keeper! Would using boxed brownie mix be just the same? Oh WOW! This looks AH-MAZING! Do you think it would work to use a basic 8×8 brownie box mix for the bottom layer? Hi Val 🙂 Thank you! I’ve never done it, but I’m sure it would work just fine! My fiancé doesn’t like Cheesecake at all, but he absolutely loved this one and has asked me to make it again. It is one of my favorites now, thank you for sharing! Hi Julie 🙂 Oh wow, that’s a really high compliment!! So glad you both loved it!! OMG THIS RECIPE LOOKS GREAT! I was wondering if I could use oat flour in the cookie dough because I’m not a fan of the raw flour taste. If not I’ll just toast my flour in the oven before. And white whole what for the brownies? 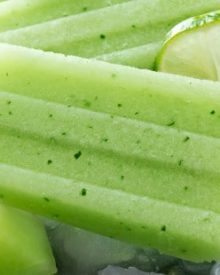 I feel like it’s a stretch, but it takes off a miniscule amount of guilt from this recipe, which is much needed for me. Thanks! Hi! I just I’d let you know that the cheesecake made $85 for a leukemia/lymphoma society. 🙂 Thanks so much for a great recipe! Hi Angelinah 🙂 I wouldn’t bake the cookie dough, as it’s an altered edible (eggless) version, and not the type of dough you would bake. Ooohhh thank you so much. I will make it as it is then☺you’re the best! Oh wow! Cookie dough is my weekends than you for this amazing recipe! The cake looks fabulous! I was wondering if you have any experience in freezing it and wether it fairs well when thawing? This looks amazing! I am making one right now. I just have a question though. As I am making the cheesecake layer, I placed all the ingredients in my stand mixer as said. However, it seems to be taking awhile to make it smooth. How long should it take? (I am beating it on the Stir setting of the stand mixer setting). Or should I have placed the cream cheese in first then started the mixer and slowly added ingredients? Thanks for help! I haven’t made cheesecakes too many times and was making this one for a New Years Eve get together! Hi Kelly 🙂 How long it takes depends on the speed you’re mixing it on and how soft your cream cheese is. I usually beat mine on about the “2” speed and it takes about 3-4 minutes. I’ve never had a problem using the room temperature softened cream cheese and having it not get smooth, so my guess is that you just need a couple more minutes 🙂 I hope you all love it and Happy New Year! 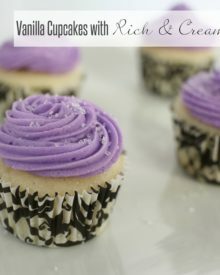 I just made this into cupcakes to take to Thanksgiving dinner…AMAZING!!! I wish I could post a picture. Soooo decadent and rich. I topped with a dollop of homemade whipped cream. To die for. Thank you so much for this great recipe! 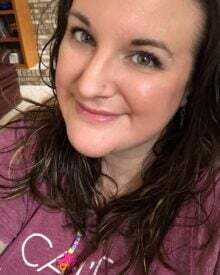 Hi Korann 🙂 I’m SO happy to hear that you loved this recipe… and I bet your cupcakes were beautiful! I wish there was a spot for a photo in these comments! Hi, i have small question. #’The cheesecake without flour u bake 50 mins? and the cookie doughe u dont bake it? im confuse since the layer without flour is baked and the one w flour do not need to bake?? Are there any substitutions for eggs in the cheesecake layer as my daughter has an allergy to them. Hi Ashleigh 🙂 Unfortunately, I’ve never tried to make this without eggs, as we have no allergies here… the eggs stabilize the cheesecake layer here, so I’m not sure exactly what to substitute that would give a similar function and texture. Perhaps google some egg-less cheesecakes and then try to weave that recipe into this one? Best of luck! You know the liquid that comes in canned chickpeas? It’s called “aquafaba” and it’s a common vegan egg white substitute! 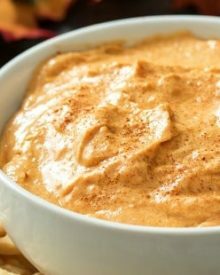 Use “no salt added” canned chickpea liquid, whip it (it will whip and look just like whipped egg whites), fold it into the batter and it could very well help set the cheesecake just like eggs would once baked. Now this is only a theory and I don’t know a substitute for the egg yolk part but I don’t see why it wouldn’t turn out. This recipe looks and sounds AMAZING. One question though, would I be able to add a biscuit base as well to this cheesecake or would that be too difficult? Any recommendations on making into a mini cheesecake form? Hi! 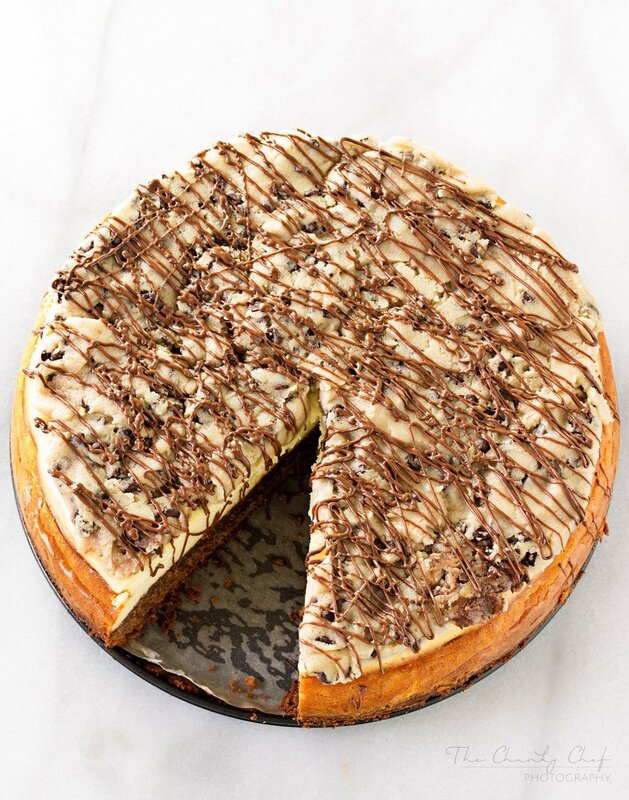 I was wondering if there was any way the cookie dough part could be stored (fridge or room temp) overnight and then put on the cheesecake in the morning? Looks amazing! Now I need a special occasion for an excuse to make this. It seems rather cruel that I see this now when we are starting a clean eating habit as a family beginning Monday! But the 15 minutes prep kinda has me thrown off. Is that if one possesses super powers? I would think it more like one hour prep considering the 3 layers – – and that would still be moving at an impressive clip! wondering if you think this could be made in advance and frozen? Hi. Does the substitution of Greek yogurt for sour cream has a difference in flavor for the dessert and is it plan yogurt? Can I use almond milk for the recipe? Also, what kind of flour is used in the cookie dough layer? Is it the same all purpose flour? If I don’t want the cookie part or wabt the plain cheesecake, how do I alter the recipe? I made this desert for Mother’s Day and everyone raved about it. Thank you! And it was very easy to make like you said. I was a bit surprised that it wasn’t overly sweet like a traditional cheesecake, nor was the brownie either. For my sweet tooth, I would have preferred a more moist brownie.,,but that’s just me. I still had 2 pieces!!!! I’m worried about baking the brownie part for so long. 25 minutes plus another 50? Does it come out hard and crunchy? Made this and it wasn’t a match for me and my family. I think is was too much, our tastebuds didn’t know what was happening. Oh well, I tried. Off to try another recipe 🙂 Perhaps the Coca Cola Sundae?! Thank you for sharing, I love trying new things. The brownie and cheesecake it was a great combination but the cookie dough it was to much for me and my family it took over the other 2 flavors, next time I’ll make it without the cookie dough. Other than that everyone thought that the brownie was perfect and the cheesecake was delicious. Thanks now I can use the cheesecake recipe to make Nutella cheesecake. Hi LR 🙂 Yes, it’s definitely a very rich, intense dessert… but I’m glad to hear that you loved the brownie and cheesecake 🙂 Your Nutella version sounds very delicious! Are you serious with this!? Wow! Looks amazing! 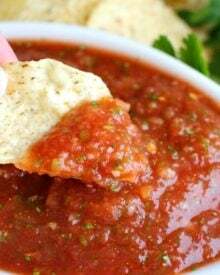 Could you make this in a 9×13 pan? Hi Ben 🙂 I can’t really say for certain, as I’ve never done it. But I *think* it might work. If you try it, I’d love to hear if it works for you! So for the cookie dough, you don’t bake it, or is it raw? Hi Elida 🙂 Nope, you don’t bake it, it’s raw… it’s eggless, so totally safe to eat. on the cookie dough part it says to cream butter and sugar with a mixer over med. heat? wouldn’t that melt instead of creaming? 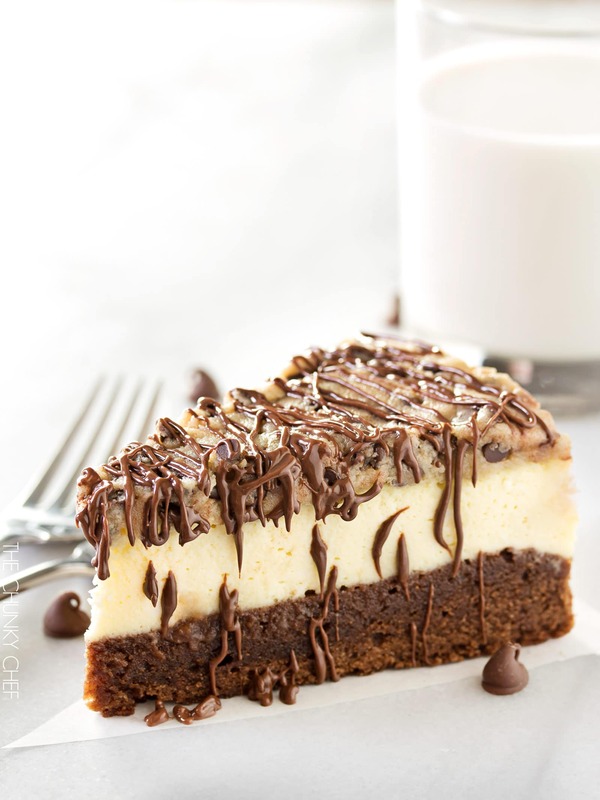 I have a new-found love of cheesecake because I recently did one, I love this cheesecake you have here because it combines 2 things I adore brownie and cookie dough!